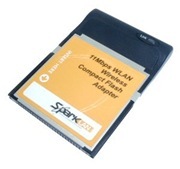 Connect your PDA to the 802.11b wireless network with SparkLAN WL-672 Wireless Compact Flash Adapter at home, in the office, or in any wireless Hot Spot areas. Increase your mobile ability and working productivity. SparkLAN WL-672 can be used together with the CF-PCMCIA adapter in mobile notebooks as well. You can have one card for both your PDA and your laptop computer. This saves you the additional cost of purchasing different network adapters.